In the 25 years The Simpsons has been on the air, nobody has aged or graduated the fourth grade, and no matter what kind of chaos goes down in a given episode, things are restored to normal so that the family can sit down on their couch again int he beginning of the next episode. 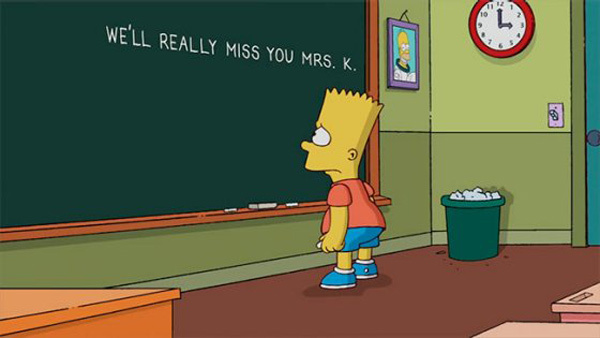 So when a voice actor for the show dies, as the voice of Mrs. Krabappel Marcia Wallace did on October 25, it is jarring. But The Simpsons writers deal with it beautifully anyway. Above is the chalkboard gag from last night's episode, in which Bart seems struck silent for once at the board he usually covers with words; he's a pretty simply animated character, but the slumped shoulders and frown say so much about real human mourning. The episode also ended with a nod to Wallace and Mrs. Krabappel, as captured in gif form by Uproxx. The Simpsons, which is already renewed for a remarkable 26th season, has been promising to kill off a major character this season, though as Jean promised above that has nothing to do with Wallace's death.